"To the women in our lives who held us, loved us, drove us and inspired us into the future, both young and old." Recorded, Mixed and Mastered by Martin Wright at Move Records studios. Our first gig together was 30th May 2013 at the Drunken Poet Hotel in Melbourne, Australia. Some of the tracks, such as House of the Rising Sun were recorded in a single take. We got to the end of that one and looked at each other - and agreed that would do! Songs are lead by various members of the band. Shows are always a lot of fun, and we have many laughs together, and with our audiences. 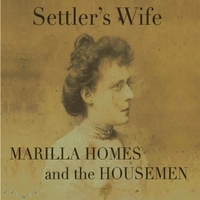 The first and last tracks on the album are written by Marilla Homes. All the rest are our take on various songs and genres - trad Irish songs and tunes, a bit of blues and a bit of country thrown in for fun. The album cover is a photo of Marilla's great grandmother, Lucy Watkin. She was a Settler's Wife, her husband having emigrated from Ireland to Australia. We had a lot of fun making this album - we hope you enjoy it!